Health Students – Are you going out on Placement? 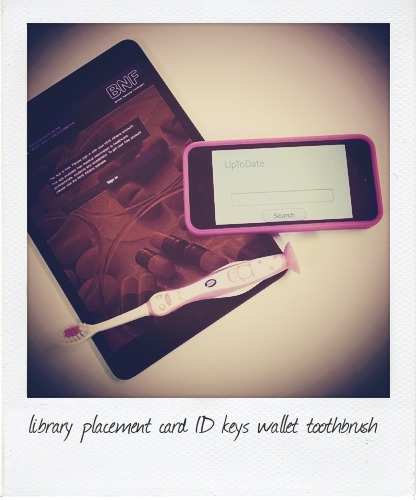 Before you go out on your health student placement in Wales there are a few things you should do before you pack your toothbrush. Make sure you have collected the library placement card, which will enable you to borrow books whilst on placement at NHS Health Boards/Trust libraries around Wales. The library placement cards are ready for you to collect from the enquiry desk of the Health Library on the first floor following announcement of your first placement. Also make sure you have got the BNF app downloaded to your phone and get the Uptodate mobile friendly site bookmarked. Look at what the Eduroam access is for the site you are visiting and get it set up to access before you go. This entry was posted in Using the library and tagged BNF, eduroam, placement, UptoDate on March 27, 2014 by Mariann Hilliar. Ever felt confused or unsure by some of the jargon used in relation with the Library? We’ve now created a video and also a glossary to hopefully help you. This entry was posted in Libraries, Using the library and tagged eduroam, librarysearch, photocopying, printing, wifi on January 10, 2014 by Lindsay Roberts. Cardiff and Vale University Health Board (UHB), working in partnership with Cardiff University, has made the eduroam wireless network available across Cardiff and Vale UHB sites. The eduroam wireless network is now available via the majority of 1,400+ wireless access points on the Health Board’s sites. eduroam is a secure, world-wide wireless service which enables students, researchers and staff from participating institutions to easily connect to the internet when visiting other participating institutions. The introduction of eduroam in Cardiff and Vale’s sites allows Cardiff University staff and students working on placement to access the University’s digital resources, online information and communications tools from their mobile devices. This entry was posted in Staff and Services, Uncategorized and tagged eduroam, wifi on August 9, 2013 by Lindsay Roberts. Cardiff and Vale University Health Board, working in partnership with Cardiff University, has made the eduroam wireless network available across selected Cardiff and Vale UHB sites. This entry was posted in Staff and Services and tagged eduroam, wifi on June 20, 2013 by Lindsay Roberts. Next month, the ‘CU-WiFi’ wireless service will be decommissioned. Our preferred service, eduroam, is a secure, encrypted wireless service. Further information and a firm date of when CU-WiFi will be turned off will be provided shortly. Why is it being done? This entry was posted in Using the library and tagged eduroam, wireless on June 19, 2013 by Lindsay Roberts. We are pleased to announce that Princess of Wales and Neath Port Talbot Hospitals are now covered by Eduroam. However windows 8 devices cannot currently connect at these locations. NHS sites are increasingly being covered by Eduroam. Morriston and Singleton Hospitals are already live. There is an eduroam app which will locate where your nearest Eduroam hotspots are. We’ll keep you posted on NHS sites as they come through. Eduroam is the faster, secure way to connect to Wifi at the University. This connection can then be used when visiting participating institutions to access network resources using the logon credentials from your own institution. This entry was posted in Electronic Resources and tagged eduroam, nhs, placement wifi, wifi on February 11, 2013 by Lindsay Roberts. If you are already using our Wifi service, please just check that you are logging into Eduroam rather than CUWifi. Eduroam is a faster and more secure service. You will also find that if you travel around to other Universities (and coming soon other NHS sites) you will be able to pick up their Eduroam access using your own Cardiff University credentials. NHS users will find that their sites are increasingly covered by Eduroam. Morriston and Singleton Hospitals are already live. We will post up details of other NHS sites in Wales as we become aware of them. This entry was posted in Electronic Resources and tagged eduroam, placement wifi, wifi on February 4, 2013 by Lindsay Roberts.